A Moroccan/Spanish/Caribbean tapas bar. At least that’s how I explain it. I had a GiltCity voucher to use on two glasses of sangria and four tapas. We wound up with six tapas but decided the four would’ve been filling enough if we chose to stop there. Not a bad deal for $30! 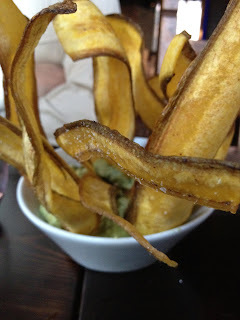 The guacamole had pineapple in it and the plantain chips to dip in it were crispy and salty. Then we had spinach and manchego empanadas, fried goat cheese balls with slivered almonds and honey, and sweet plantains with manchego and Serrano ham. It was certainly enough food for us, but it’s not like me to stop at ‘enough’. 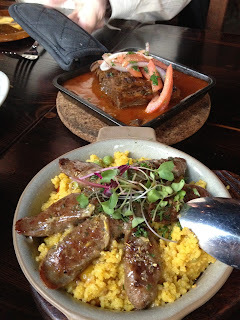 To conclude the meal we got the short ribs, and the lamb with couscous. Both were phenomenal! The portions were small for sharing, and the combination created a tasty buffet on my plate. I would go back to Ventanas again because it’s humble enough to reside in the Meatpacking District without charging cover at the door. And don’t forget, on the weekends they have rotating DJ’s and eight bartenders on staff to prevent any unwanted thirst. Loved the atmosphere and the food, we will definitely be back! !